Universal Kids' Summer Kickoff Event Was Camp-Tastic! Universal Kids had a summer kickoff event last Sunday which was full of energy, fun activities, yummy food and impressive attention to detail... pretty much a reflection of the network's awesome show lineup which includes the likes of Top Chef Junior, Beat the Clock and the Big Fun Crafty Show. #CampUniversalKids at Universal Studio's Globe Theater was a wonderfully organized themed event to promote the network's summer show line-up. Giant tents served as lounge areas for guests and food offerings included delicious beef skewers, a S'mores bar, a liquid nitrogen ice cream table, a mac & cheese buffet, a hot dog station and enough appetizers, including delicious bites created by the network's popular and talented junior chefs to make me break my summer body diet! There was an awesome DJ spinning kids' favorite jams and did I mention my husband and I enjoyed tasty adult beverages? It was really a bash to let the world know that Universal Kids knows how to throw a good party. 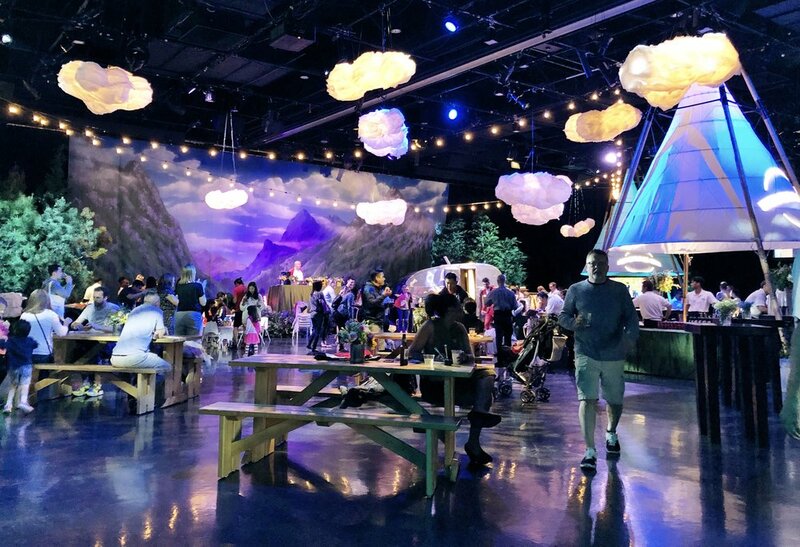 But most importantly, it was a reminder that Universal Kids delivers quality productions, both as live activations and network show programming for the entire family! Carly Ciarocchi, host of the Big Fun Crafty Show spent some time with Toby trying to understand what my 2-year old was doing with a pair of scissors and a marker...lol! Sitting at a table set-up with a generous supply of crafting items, Toby was too busy (or shy) to meet eyes with Carly and answer questions about his intentions with scissors and markers! In the Tie-Die shirt activation, Benny made his first attempt at creating a colorful shirt. He came out with a black smudged t-shirt because he was a bit too generous with the black-colored dye but I'm sure he'll still wear it proudly! Next to the tie-dye tables Toby and I enjoyed big wigs and colored glasses for a photo opp inside a camping trailer! We made several trips to enjoy delightful food bites created by the kids from Top Chef Junior... OMG! Can I just say they put this mama's cooking skills to shame! Every thing prepared by the young chefs was delicious! Outside the Globe Theater, Toby nearly ruined someone's perfect tower of mega-sized wooden Jenga pieces while Benny delved into the unique sport of archery. And who can forget the moments we spent trying to take a family picture with the boys in front of a Universal Kids' backdrop!? I'll just say it didn't work out too well but we still got some fun shots. They lesson here was simply to avoid an attempt at a family photo. Experiences like this one really make us want to continue supporting an awesome network dedicated to fun, healthy and enjoyable entertainment for children. Thanks Universal Kids... we can't wait to watch more awesome show episodes.